What would a leading scientist put on his (or her) holiday wish list? While we may not know any scientists (prominent or otherwise) personally, we can get a glimpse of what one astrophysicist would like. Martin Rees, a prominent British researcher, has given us a “dream list” of what he would like to see happen in the near future. The source of this book is the annual Reith Lectures, sponsored by the BBC in honor of Sir John Reith, the corporation's first director-general. Reith established the series to provide a venue for distinguished speakers from a wide variety of disciplines to stimulate public understanding and debate about contemporary issues. Dr. Rees covers four major topics in his presentations. His first lecture discusses how involved scientists should be with public policy issues. In his second lecture, he addresses issues which he feels are of great threat to humanity today—climate change, the growth in world population and the problems with an adequate food supply, and the supply of energy for the future (all three concerns link together in several ways). Scientists have not, according to Dr. Rees, been sufficiently vocal in terms of public policy advocacy. While he feels that scientists need to stay within the disciplinary boundaries of what they know best, Dr. Rees believes that these men and women need to become stronger advocates for what they feel needs to happen in society. Throughout the book he brings in examples from various areas of the world, although he primarily focuses on Europe and the United States. Dr. Rees paints with a broad brush, both in terms of advocacy and his vision of future scientific progress. He strongly encourages more government spending for science and bemoans the present dearth of meaningful funding for the grand projects he envisions. President Obama gets several positive mentions, but author Rees seems oblivious to the current financial situation in both Europe and America, where massive deficits create substantial budget problems (said deficits contributed to in great part by his hero Obama). The related problems of world population, food supplies, and energy all need massive increases in funding in order to be solved, according to Dr. Rees. This is a true statement, but oversimplifies the complexities of these three issues. Again, there is no practical mention of how all of this is to be paid for, except for yet higher taxes. Dr. Rees has some very valid concerns about the state of science education in both Europe and the U.S. There is a growing lack of trained teachers to convey the scientific knowledge that exists, and no truly effective approaches exist at present for teaching science. He explores the possibilities available with global communication tools such as the Internet and sees a real potential in many of these possibilities. Unfortunately, he also seems to advocate a rather elitist set of privileges for scientists that would not contribute greatly to dealing with science education. Dr. Rees also hurts his cause by dismissing conservative religious people, who he feels are “anti-science.” Instead of exploring what the real concerns are, he writes off a significant portion of (at least) the U.S. population, placing his confidence instead in the members of the “mainstream churches.” Apparently Martin Rees is not aware that these churches are rapidly dwindling in membership. 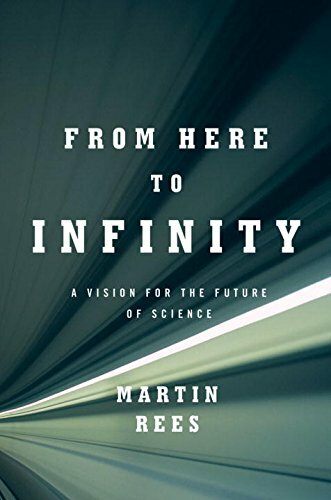 The overall vision cast by Martin Rees is an exciting one, especially if one is a scientist. He has a good grasp of many of the complexities of these issues. It would be interesting to see him explore in more detail the solutions to the problems and the visions that he sees.